I have some exciting news, we are moving house. Our new house is still being built but should be ready by the end of July and we will move in during August, well, that’s the plan, fingers crossed nothing goes wrong. At last, the children will have their own rooms and we are already thinking of ways to decorate them. The girls will probably go for something pink and girlie, although Boo’s favourite colour is blue so maybe a mixture of pink and blue. The Little Man loves cars, trains and boats, a typical little boy. 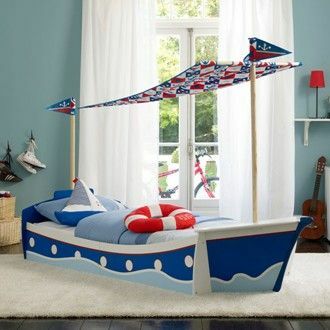 I think the little man would love a boat theme like this! I just love these blinds, they would brighten up any room! These are just initial inspirations, I’m sure as time goes on we’ll change our minds many times. We’ll have to stick with adding accessories for colour at the start because being a newly built house we won’t be able to paint for twelve months. So plenty of time to get the creative juices flowing and then we can let go with the colour. In the meantime we could use prints and wall stickers to brighten up the walls. Next has some great ideas, like this Space Invaders Wall sticker, a great way to add a splash of colour. It will be lovely to have a blank canvas to start with and I’m really looking forward to decorating. I have found this brilliant free e-book of decorating tips ’28 Tips on How to Decorate’ to download. It has loads of information on wallpapering and painting as well as tips for tiling and fixing shelves. Also, there are handy tips on getting paint out of carpet (oh yes, done that before!) and how to fix squeeky floorboards. You can also download a free app. to give you quotes from local traders if you don’t fancy doing all the work yourself. This post has been submitted to the Next Bloggers Network. I have not received anything from Next for writing it and all thoughts and opinions are my own.